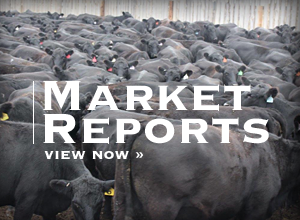 Story by Gayle Smith | Potter, Neb. The statute was exquisite. 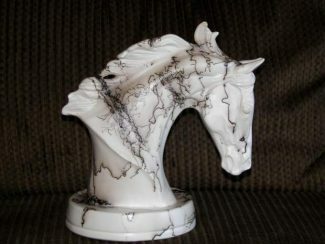 The bust of the Quarter Horse was white, but the hair from the departed horse's tail burned a unique, swiggly black design into the statute. Although the horse was gone forever, his owner would always have a piece of him to treasure every time he looked at the one-of-a-kind unique statute proudly displayed on the mantle. Adele Young has been making these lasting mementos to give horse owners something from their horse that they can cherish forever. "It keeps me really busy," the Glenrock, Wyo., pottery artisan recently explained. 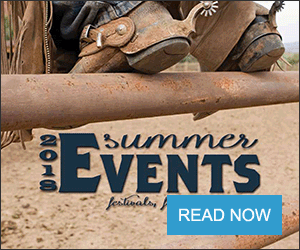 "There are so many people out there who have had a horse in their lives for 25 years or more. When the horse is gone, it leaves such an empty space in their life. When I make them a piece of pottery with their own horse's hair burned into it, it's a way they can have a lasting tribute to the animal in their life," she explained. Young has been making pottery of some form, and selling her work, since she was in high school. After deciding to make it more than a hobby, she has watched market trends, and explored different ideas to keep her pottery marketable to the public. "I didn't want to just sell the same things all the time," she explained. 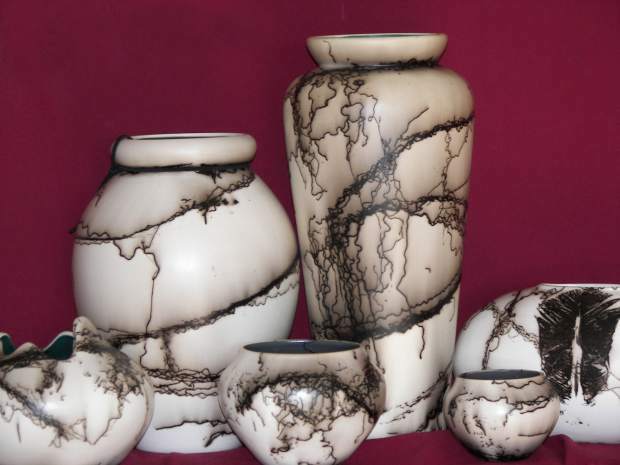 "I had seen the horsehair pottery, but no one would tell me how to make it. I finally decided to cast a bunch of pots, and then I started firing them to figure out how to do it on my own," she said. "I broke a lot of pots, but in the process I figured out a dependable firing schedule. Since then, I haven't had any breakage at all," she said. Young has found that creating horsehair pottery can burn if you're not careful. "I fire the pots in the kiln, and when the temperature is over 1,000 degrees, I suit up with a respirator and welding gloves. I pull out the pot, and have 90 seconds to put the horsehair on it. The horsehair will burn into the pot. After 90 seconds, the pot is too cool," she said. "Horsehair is very spontaneous, and it seems to do what it wants to do. I have very little control over the design it eventually takes. When I put the horsehair on the pot, it smells like a branding," she added. 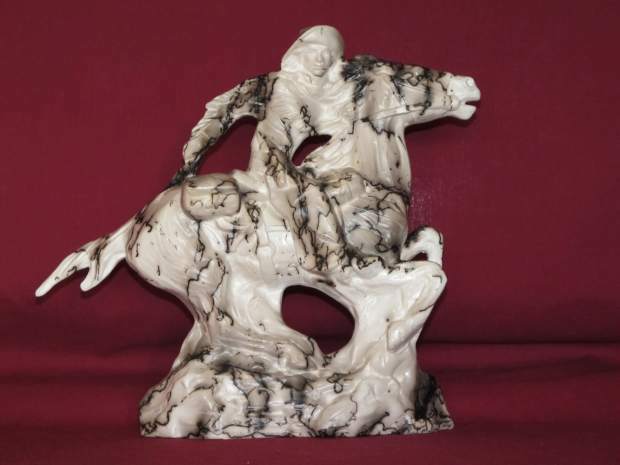 Some of the most unique horsehair pottery Young has made is a series of Pony Express statutes she made last year commemorating the 150th anniversary of the Pony Express. "Several members of the Pony Express sent me a lock of their horse's hair," she explained. "It was usually a dearly departed horse, and one that was ridden in the Pony Express reenactment. I used the horsehair from the actual horse to make a statute to commemorate their dearly departed horse," she said. 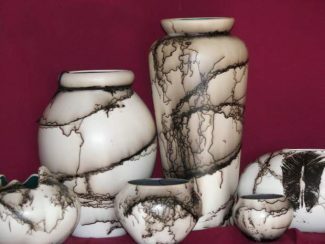 Although many of Young's creations are special orders, she also creates some of her own designs which she sells through her online store at WyoPotter.etsy.com. 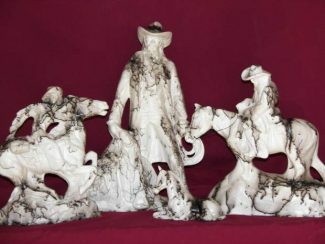 Her pottery takes the form of Christmas ornaments, pendants, pots, vases, lamps, rodeo and wildlife statutes and cremation urns. When clients request a custom order, they decide on which piece they would like her to make, and then they send in some hair if it is meant to be a memorial piece. "I usually need enough hair, about the size of a pencil in length and diameter," she said. "If it doesn't take all of it, I send it back to them because I know that is all they have," she said. In addition to horsehair, Young has also used Bighorn sheep hair, wool, bison hair, sawdust, and sugar. "I like to experiment with different things," she said. "But, I like to be able to hold the hair in my fingers so I don't get burned when I put it on a 1,000 degree pot," she said. "I have used elk and antelope hair, but I usually burn my fingers when I do that," she added.